When the sun starts shining, those seedlings will soon be reaching up to meet it. Some plants have nice strong stalks to hold them up, but others need our help. 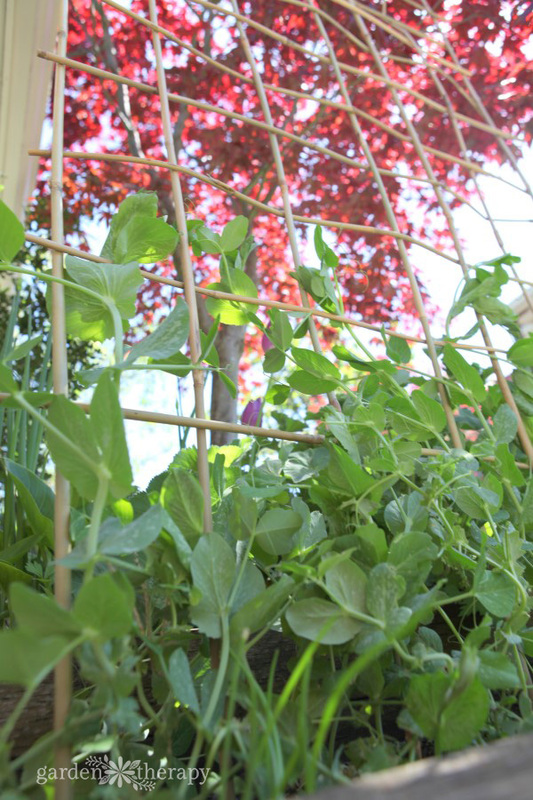 Peas, beans, and other vining vegetables need some sort of trellis to support their growth towards the sky. 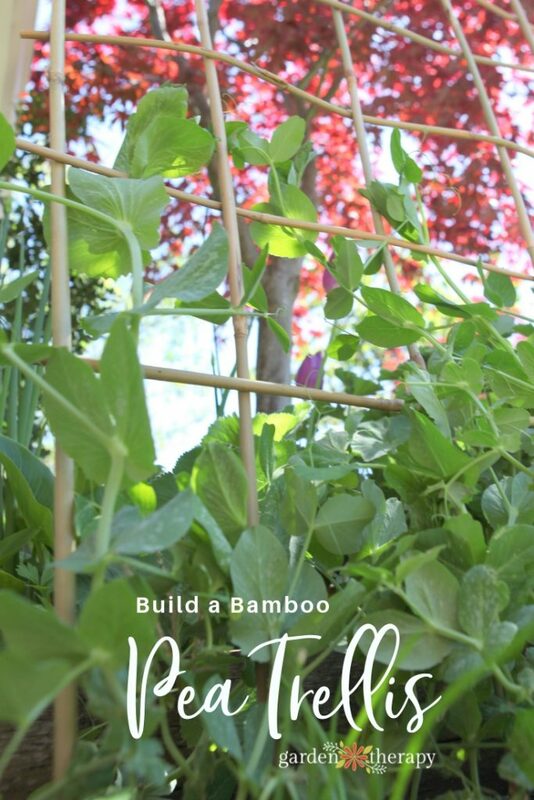 This project shows you how to easily build a bamboo trellis with only one material. Yep, you guessed it…bamboo! 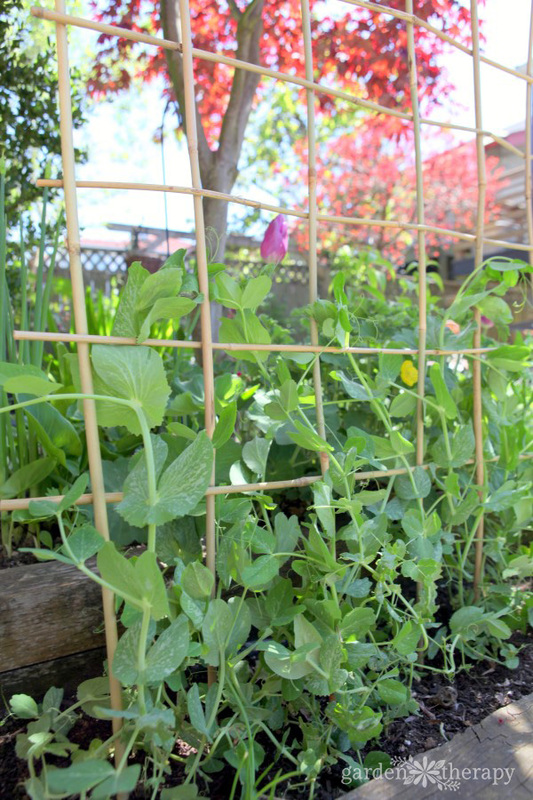 Pea plants grasp onto netting, twine, or thin bamboo poles with their curly tendrils. 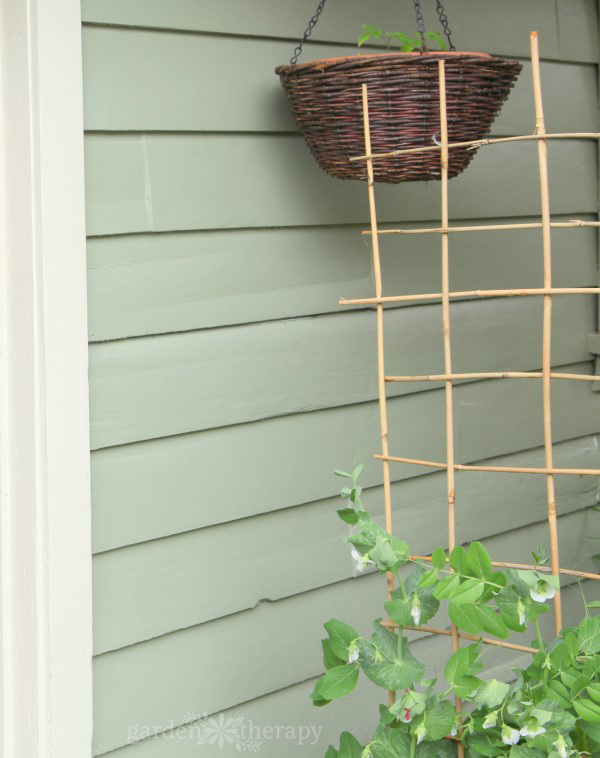 This pea trellis made with twine is a perfect solution to fit a lot of peas into a small space, but it can also be as successful and a bit more sturdy to use a woven bamboo trellis (plus it’s better for those less gentle pea pickers, AKA kids and the dog). As the only material is bamboo, the importance is in what size poles you choose. Pole beans wind themselves around poles so they will need a bit more support than a twine trellis can handle. 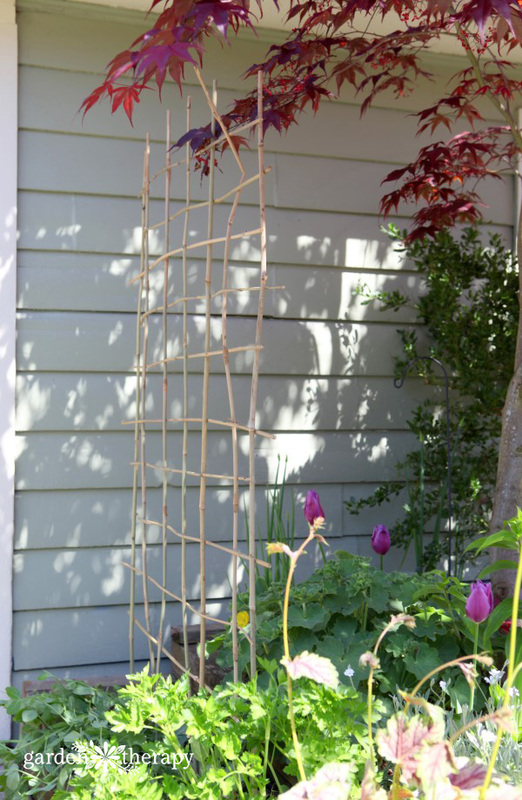 They love to grow up high in the sky, so make sure that you get really long bamboo stakes for a pole bean trellis. Cucumbers and squash can also do very will climbing up a trellis, but there needs to be enough strength to hold the thick vine and then the heavy fruit as it ripens. Depending on the size and weight of the fruit, you can choose a thicker and stronger bamboo pole to weave. Now that you have your bamboo poles, you can start to build. Place poles about 6″-12″ apart (depending on the size of what you are working with) by firmly staking the end into the ground. 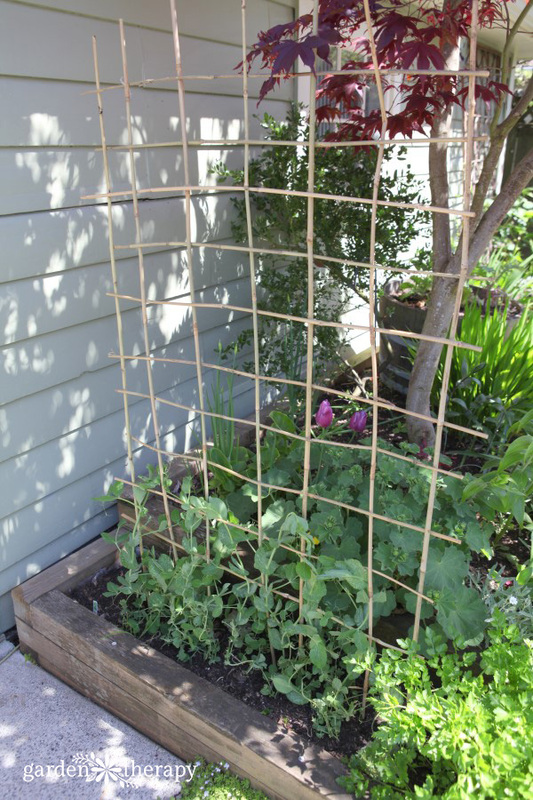 This smaller pea trellis is spaced 4″ apart with fairly thin bamboo that measures 5′ high. Cut the bamboo that you will be weaving to 6″-12″ longer than the distance between the two end poles. Weave the length of bamboo through the stakes by passing it alternatively behind and in front of each stake. Slide the pole down through the stakes to about 6″ from the bottom of the stakes. Repeat this step with another pole but alternate how the pole weaves front to back with the first pole. Continue this process until you have a sturdy trellis that has the spacing you were hoping for. 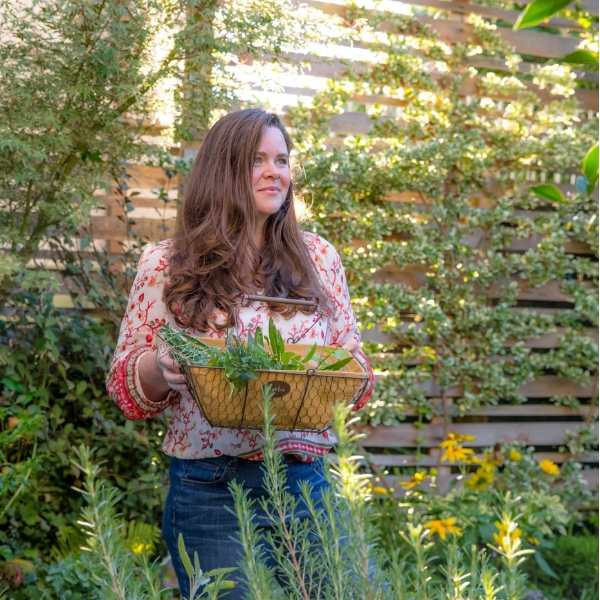 You will be surprised at the strength of this trellis and how easy it is to make. If you have access to a lot of sturdy and straight branches, you could also make this structure from branches. 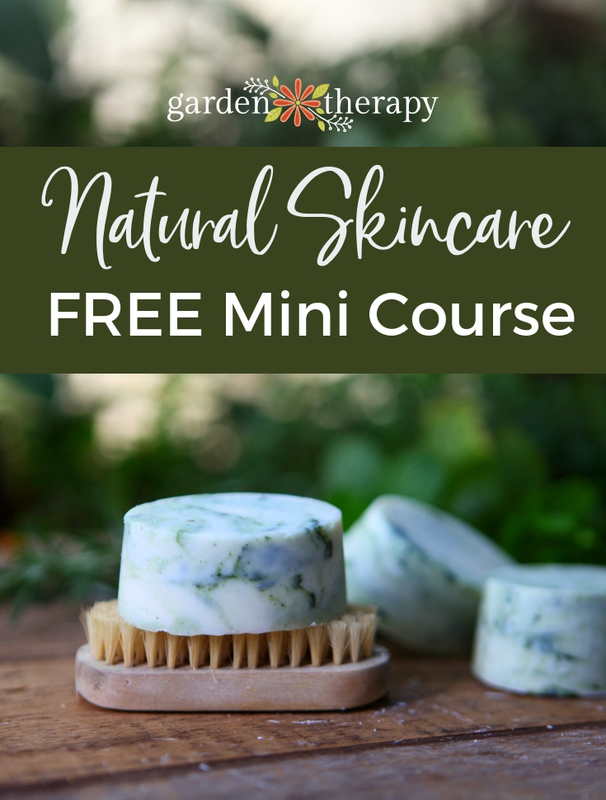 It will look beautifully rustic and will also be totally free! You can’t beat that. Now all that is left is to wind the plants through the first few poles and let it grow. I planted some bamboo and was delighted at it growing, then growing and GROWIMG. Then I decided that I had to trim some of it back. And then some more. Need I go on? I was thinking of creating some out of the poles, Now I Know!!! THANKS!! !